Published: Dec. 17, 2013 at 03:00 a.m. Updated: Jan. 2, 2014 at 09:38 p.m. The Green Bay Packers and San Francisco 49ers will meet during Wild Card Weekend for the fourth time since the start of 2012. This is quickly becoming one of the better non-divisional rivalries in the NFL. Well, maybe for just the 49ers who have won all three of those aforementioned meetings. Packers fans might not be too fond of this at all. Still, there's a plethora of history between these two teams, so this seems like the perfect time to take a look at the six best games in this rivalry. And believe me, I'm going to go super old school with one of those selections. So if you will, please enjoy the selections. I hate to break into hyperbole so early, and I really didn't want to pick this game because it is the most fresh in our minds. However, there haven't been many Week 1 games I have anticipated as much as this one. And you know what? It lived up to the hype as the 49ers rallied for the win as Colin Kaepernick once again torched the Pack. This game seems like a mere note in history; be it a blowout and all. However, this was the final game of Vince Lombardi's first season. The Packers didn't make the playoffs, but the win over the 49ers ensured Lombardi would have a winning season as Green Bay finished 7-5. Lombardi would not have a losing season with the Packers. Or as I like to refer to it, The Colin Kaepernick Show. I had seen Colin run past defenders like they had been standing still in the past, but those were games against Boise State, UNLV and Idaho. I had never seen or expected it against an NFL team. Kaepernick finished with an NFL-record 181 rushing yards and two touchdowns. The Packers spent most of the early 1990s losing in the playoffs to the Dallas Cowboys. 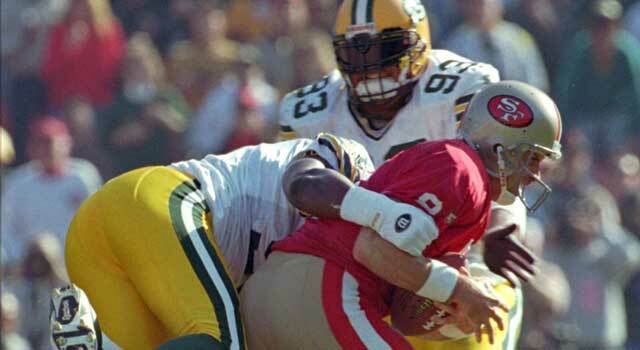 But the Packers were sent to San Francisco for the divisional round of the playoffs for the 1995 season, and ended up with the upset win over the 49ers. Of course, the Packers' season once again ended in Dallas as the Cowboys beat Green Bay in the 1995 NFC Championship Game. Niners fans will point out the team was scuffling along with Elvis Grbac at the time, but this was a significant win for the Packers who would end up as the Super Bowl champions at the end of the year. Yet, if Brett Favre doesn't rally the Packers for a win here, the fortunes of both franchises could have changed dramatically. The Packers had appeared in back-to-back Super Bowls, but had to go to San Francisco for this one. Steve Young rallies the 49ers late and his 25-yard touchdown strike to Terrelle Owens has come to be known as "The Catch II" in some circles. Not me, because the 49ers would be eliminated by the Falcons the following week. Still a great, great game. "Pick 6: Best Johnny Manziel pop culture momen..."